THIRD STOP: Delicious yet Affordable Rap Steak and Cakes! I friend of mine told me that Rap Steak and Cakes is one of the best dining places in Taft. Not only they offer good food, but affordable price for students nearby. Rap Steaks and Cakes (aka as Rap's) known for its steaks but most of all the killer gravy! but there's still more space as you enter thoroughly. Too bad we're in a Food Hunt and I can't try these desserts. teeheee!! Porterhouse Steak (190+) - Flavor was good, cooked just right and served with rice and their gravy. I don't get the fuss when they said jokingly that "hindi sinasabaw ang gravy ah?" But when I tried it myself, whooaaa I was blown away. THIS. IS. NOT. YOUR. ORDINARY. GRAVY!. It's a butter gravy that was said to have that yummy bone marrow on it. ahhh. Sarap! 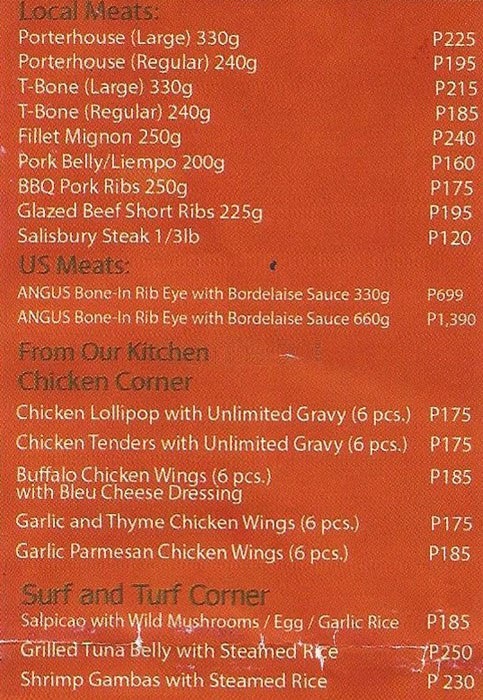 Gravy pa lang, solve na! I'll definitely visit their branch in Ortigas!